The German and French leaders will propose "important changes" to the way the eurozone operates after talks on controlling the bloc's debt crisis. 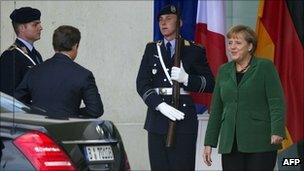 Chancellor Angela Merkel and President Nicolas Sarkozy said the aim was closer and more binding economic and financial cooperation between eurozone countries. The leaders said they would give further details by the end of October. The nations were "determined to do the necessary to ensure... recapitalisation of Europe's banks", Mrs Merkel added. Germany and France have differed over how to recapitalise Europe's banks, said by some to require between 100bn (£86bn; $134bn) and 200bn euros to withstand the sovereign debt crisis. Paris is believed to want to use the eurozone's bailout fund - the European Financial Stability Facility (EFSF) - to recapitalise its own banks, while Berlin is insisting the fund should be used as a last resort. But speaking after the talks in Berlin, Mr Sarkozy said it was "not the moment" to go into the agreement's details but said that the Franco-German accord was "total". Mr Sarkozy told reporters: "We are very conscious that France and Germany have a particular responsibility to stabilise the euro. We need to deliver a response that is sustainable and comprehensive." The leaders suggested that their package of proposals would include a plan for recapitalising European banks, accelerating economic co-ordination in the eurozone and dealing with Greece's debt problems. Chancellor Merkel has insisted that the 17-18 October summit of European leaders in Brussels must send a clear signal on the issues in a bid to restore market confidence. Other topics on the leaders' agenda were thought to have been the Franco-Belgian bank Dexia, Europe's first bank to fall victim to the current debt crisis. Earlier on Sunday, the governments of France, Belgium and Luxembourg said they had agreed a plan to rescue the bank. "The proposed solution, which is the result of intensive consultations between all involved parties, will be submitted to the Dexia board, whose responsibility it is to approve the plan," a joint statement said. The board was meeting on Sunday afternoon. Meanwhile, talks are continuing over the latest bailout tranche for Greece, which could run out of cash as soon as mid-November. The European Commission, the European Central Bank and the IMF are currently deciding whether to release about 8bn euros to help the Greek government pay its bills. This is money from the original 110bn euro bailout agreed last summer. Another 109bn euro bailout package was also agreed by European leaders in July, but this has yet to be ratified. Despite efforts by leaders to contain the crisis, there is little evidence that its end is nearing, analysts say. "There is a high risk that this crisis further escalates and broadens," German finance minister Wolfgang Schaeuble said. On Friday, the international ratings agency Fitch downgraded the sovereign credit ratings of Italy and Spain, and another agency, Moody's, downgraded 12 banks in the UK and nine in Portugal. Plans to expand the EFSF, and give it greater powers, were also agreed in July and have been ratified by most national parliaments. Slovakia will vote on the proposals this week. However, these plans are now seen as inadequate and leaders have said they hope to announce new measures at a G20 meeting in Cannes at the beginning of November. Q&A: What went wrong in Spain? The World Bank is predicating a "difficult" year ahead for the developed economies, despite an improvement in the financial markets.